What do you do when you’re craving a bbq pork bun (char siu bao) but you live too far away from the city so there’s no easy way to get one? 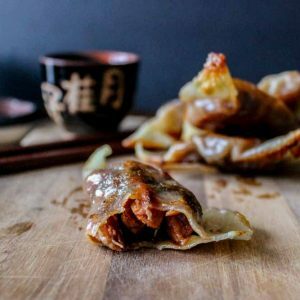 Make chewy crispy bite sized bbq pork (char siu) dumplings! A few days ago, we had made some char siu. (You can find the recipe here: ‘Sweet and Sticky Chinese BBQ Pork (aka Char Siu)‘). It hit the spot, or so I thought. Apparently it wasn’t enough, because today I am craving bbq pork buns (char siu bao). What to do, what to do? So bao? Not, today. It’s in my bucket list of things I would like to learn to do but not today. Today was going to be crispy chewy bite sized morsels stuffed with char siu kind of day! A snacky kinda day! 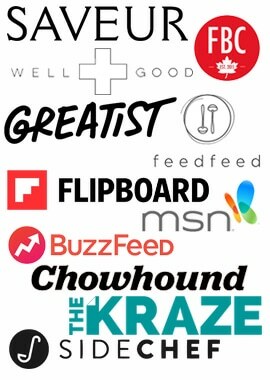 Most of these ingredients should be available at your local grocery store. If not, then you can most likely find hoisin sauce, oyster sauce, Chinese five spice and dumpling skins at a Asian grocery store. 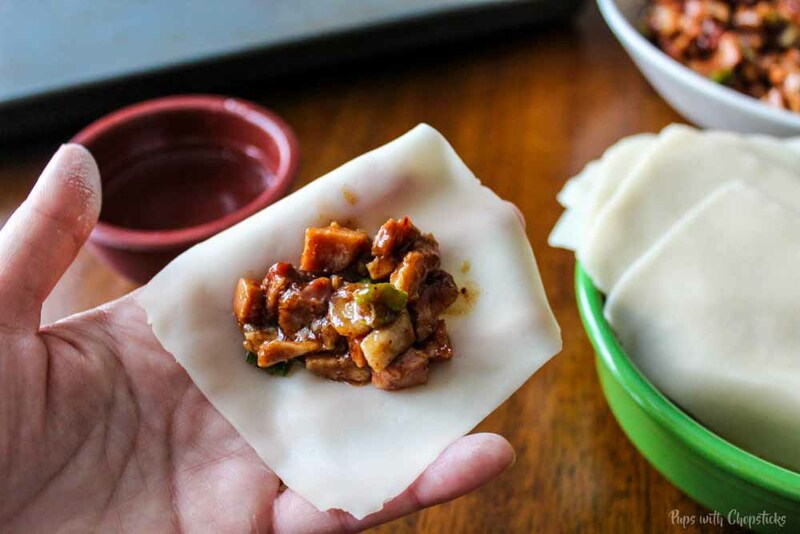 There are many different types of dumpling skins out there, the two main ones are dumpling skins and wonton skins. 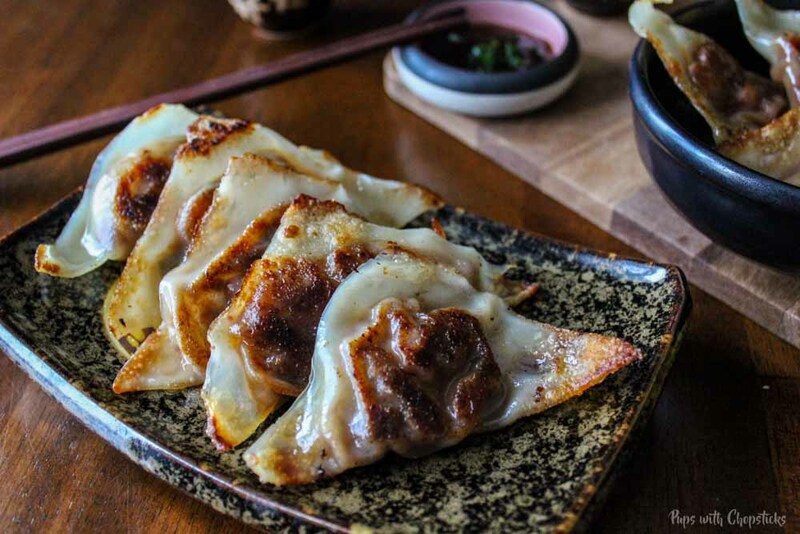 For this recipe, I would highly recommend using dumpling skins for their fabulously chewy, dense texture. Wonton skins are a lot thinner and a lot lighter – they still work but it would produce a lighter and less chewy dumpling. Wonton skins: they are very pliable and bendy in its packaging because of how thin and light they are. They are also easily separated because they are floured generously between skins. They usually have eggs in the ingredient list. They come in both round and square shapes. 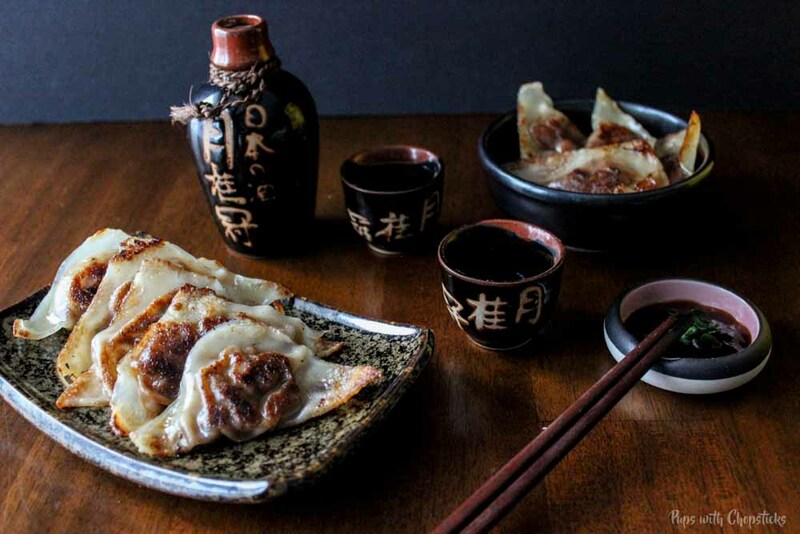 Dumpling skins: they are more dense and thick and feel a bit more doughy.. So you won’t be able to bend it as easily, they are more pale in colour (wonton skins are usually more yellow) and the skins are also more densely stacked together (almost stuck together). They usually don’t have any egg in the ingredients list and they also come in round and square shapes. 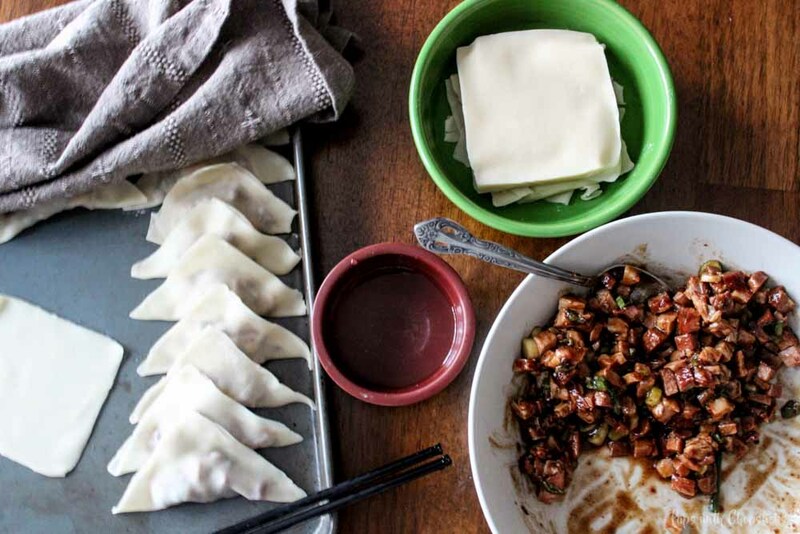 Tip #1: Since there is no raw meat in this the filling of these dumplings, these are fun things to wrap with kids too. Tip #2: If you’re like me and love the crispy, chewy skin, then don’t over stuff the dumplings! 🙂 Less filling, means more crispy chewy skin! 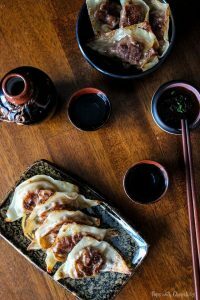 Chewy crispy Chinese BBQ pork (Char Siu) dumplings that are simple to make right at home! Combine all the ingredients in the ‘Dumpling Filling’ ingredient list together into one bowl and mix until the meat has been coated in the sauce. To wrap the dumplings, fill the center with a teaspoon of filling (or less if you like a more chewy crispy dumpling). Use a bit of water along the edges as the “glue”. Fold the dough over and press on the seams to put it together. Add oil to a non-stick pan and adjust the heat to medium low. Once the oil is hot and shimmering, add a few dumplings into the pan, careful not to overcrowd it. Remove from the pan when the dumplings are crispy. 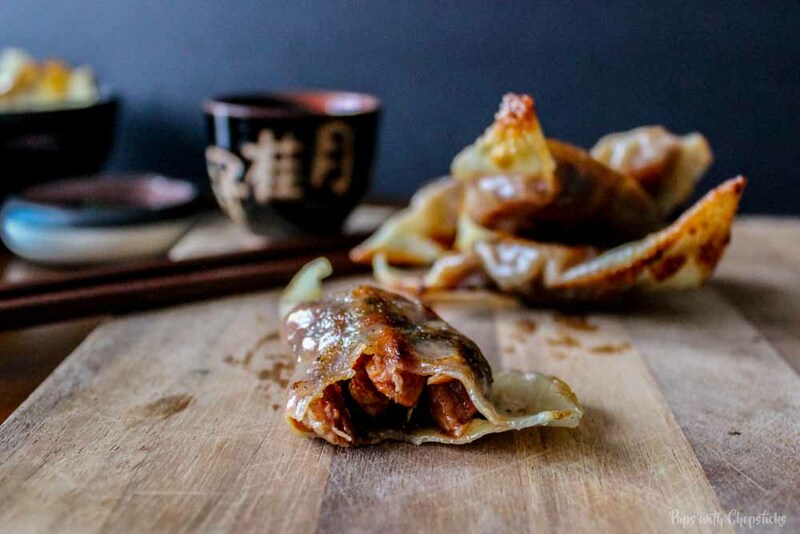 If you like dumplings that are chewy and crispy, put less filling in them. It gives you more skin for that wonderful chewy crispy texture.